Recently, I watched “Arrival”. The film, which explores a linguist attempting to communicate with extraterrestrial visitors, holds 8 Oscar nominations including Best Picture. From the start of the film, a melancholy feel was evident. The camerawork and lighting, especially in the scenes in the alien spaceship, are brilliant. The aliens themselves are not very special (they resemble large squids) and the spaceship is quite simple in design. However, the intentionally minimalist effect leaves more room for thought. Also, the film score (which is deliberately sparse) is chilling and original. The alien sound effects (lots and lots of bass) rattled the speakers! “Arrival” emphasizes visually expressing its story; however, it does this at the expense of the acting. Although I thought the acting was great (particularly, Amy Adams and Jeremy Renner’s performances were notable), the film seemed to overshadow the actors. (Also, the first 30 minutes is quite slow and boring.) 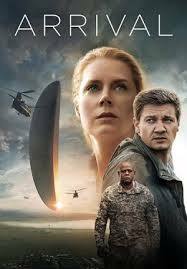 Overall, I think that the greatest triumph for “Arrival” is that the film engages you into the story. As said before, it is a “thinking” film with little action. I would recommend this to people who like slower-paced movies.